East Mandan Hill as it appears from the air in Summer 2008 including KNDR radio tower and equipment shed. Mandan Hill, or frequently referred to as "Crying Hill", has welcomed visitors and returning residents with its notation for over 50 years. 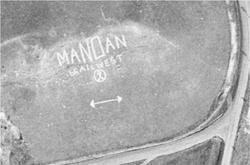 The landmark is comprised of three separate features; (1) concrete letters denoting the city's name on the northeast face of the hill; (2) the word "Mandan" spelled out in trees on the south face of the hill; and (3) the hill itself, a sacred place culturally important to the Native American population. In the 1930s, small towns across the state and probably across the country adopted the practice of recording its name on a nearby hillside. Similar efforts were undertaken by other North Dakota towns including Center, New Salem and Bowman whose signs also remain intact today. In the days before GPS coordinates and radio navigation aids, the forerunner to the ND State Aeronautical Commission encouraged rural areas to denote their community's name on watertowers and hillsides to assist airplane pilots in identifying their location during cross-country flights. Another version of the truth attributes the practice to plain civic pride. Culminating two years of intermittent work and spearheaded by Mandan Pioneer newspaperman Edwin D. Tostevin. The sign was suggested by Tostevin in 1932 during a meeting of the Mandan Lions Club. The Mandan Boy Scouts completed a 300 foot long by 70 foot high sign on the south side of Mandan's Crying Hill in June 1934. Mandan's layout features the two middle characters as upper case letters 85 feet high to represent the state's of North Dakota's official abbreviation. The project involved forty-seven truckloads of rock which area business sponsors had delivered to the base of the hill. The stones were collected from fields around the city. The Boy Scouts applied more than 12 gallons of white paint to the stones to brighten the letters before hauling and placing the rocks. The local Boy and Girls Scouts maintained the sign for more than 30 years. In August 1963, eight gallons of paint and 12-hours of effort by the Mandan Jaycees members went into rehabbing the sign. A second line consisting of white painted railroad timbers was added to promote the Custer Drama at Fort Lincoln State Park. In June 1959, work was again completed on refurbishing and replacing stones and repainting the sign. Railroad ties were added to the display which denoted "Trail West" to promote the new Custer-based drama debuting at Fort Lincoln State Park in July 1959. The project was sponsored by the Mandan Jaycees with member Larry Sullivan serving as project chairman. With the construction of Interstate 94 on the north side of the hill in 1968, the original white-colored sign was transferred from the hill's southern side to the east side in 1987 to be viewed by approaching traffic. Instead of using stones, large concrete rectangles were constructed. This designed was expected to discourage vandals from removing stones and/or destroying the letters. The marker is credited currently as being the largest sign in North Dakota. Trees were planted in the late 1990s across the original location of the sign, i.e. the southern face of the hill, also spelling out "MANDAN." The first European explorers, sons of the famous French explorer Pierre Verendrye, were reportedly greeted in 1738 by Mandan indian chief Good Fur Blanket just below the south side of the hill. However the greater significance stems from its importance to multiple Native American Indian tribes. 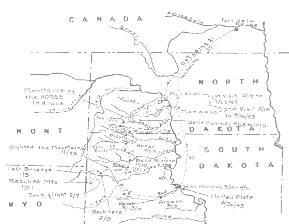 The Mandan, Hidatsa, Lakota, Sioux, and Arikara tribes all attribute sacred events and rituals of taking place there. As the highest place in the area, Crying Hill was frequently sought out as a place for prayer and solace; to asking for a healthy baby by pregnant women or a �vision quest� seeking guidance from a departed loved-one. The area was also used by Native Americans to mourn their dead. Whether its importance is of cultural significance, or evokes fond childhood memories sledding down its slippery snowing slopes, the place is a true historic landmark.